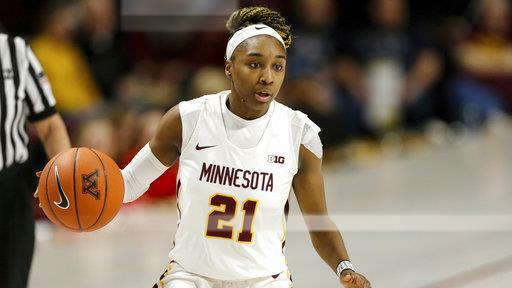 MINNEAPOLIS — Playing in overtime for the first time this season, Minnesota (17-7, 6-7 B1G) outlasted Northwestern (14-10, 7-6) Sunday at Williams Arena, 73-64. The win, which was the 700th in program history, gave the Golden Gophers a regular season sweep of the Wildcats following a 61-54 win in Evanston on Jan. 31. The Golden Gophers were up 54-49 with 5:10 left to play in the game when the Wildcats went on a 9-0 run to lead 58-54 with 59 seconds remaining. It was the first lead for Northwestern since 4-3 in the first quarter. The Gophers had an answer, though, as sophomore Destiny Pitts’ basket cut the lead to two with 52 seconds to play. After forcing a missed shot, senior Kenisha Bell grabbed an offensive rebound on the other end and laid it in with seven seconds left to tie the game at 58-58. Northwestern had a chance to pull ahead when Abi Scheid was fouled with four seconds left, but she missed both free throws, resulting in Minnesota’s first overtime game since Jan. 13, 2018 at Rutgers. Pitts, who played all 45 minutes to tie a career high, notched her second highest scoring total of the season with 21. She made her first four attempts from 3-point range in the first half to ignite the offense early, and was 7-of-8 at the free throw line. All seven free throws came in overtime. She added six rebounds. Brunson reached double figures for the third time in the last four games as she went for 14 points to go along with three rebounds, three assists and three steals. Like Pitts, Brunson also played a career-high 45 minutes in the win. After forcing Northwestern into 19 turnovers in the first meeting between the teams, the Gophers upped that number to 26 on Sunday, the highest turnover total by any opponent this season. In doing so, the Gophers also recorded a season-high 14 steals. Of Minnesota’s 73 points, 33 came off turnovers.